Goodreads says, "It's been a summer of firsts for Emily Donovan. From becoming a stand-in mom to her niece Lizzie to arriving on Puffin Island, her life has become virtually unrecognizable. Between desperately safeguarding Lizzie and her overwhelming fear of the ocean—which surrounds her everywhere she goes!—Emily has lost count of the number of "just breathe" pep talks she's given herself. And that's before charismatic local yacht club owner Ryan Cooper kisses her… Ryan knows all about secrets. And it's clear that newcomer Emily—with her haunted eyes and the little girl she won't let out of her sight—is hiding from something besides the crazy chemistry between them. So Ryan decides he's going to make it his personal mission to help her unwind and enjoy the sparks! But can Puffin Island work its magic on Emily and get her to take the biggest leap of trust of all—putting her heart in someone else's hands?" Emily Donovan seems to have it all. She's got an amazing job in Manhattan, she has a boyfriend, and two very good girlfriends. This all changes though when she finds out her estranged half sister, who happens to be a movie star, died in a tragic accident. She has left her six-year old daughter, Juliet, to her, which absolutely doesn't make sense since they haven't spoken in years. But there's nothing Emily can do about it now. The paparazzi are ruthless and Emily realizes she needs to take Juliet somewhere off the beaten path and with the help of her best friend, Brittany, she stays at her inherited house on Puffin Island, where they used to summer as college friends. This sounds like a perfect solution, except for the fact that Emily has a serious fear of the water. To make matters worse, everyone on Puffin Island is curious as to why she is staying at Castaway Cottage and who exactly they are. Brittany sends over her friend, Ryan, to check on them, but it's unsettling to Emily as he is asking too many questions; plus, there's the fact that she is attracted to him. One thing is for sure, Emily and Juliet's stay on Puffin Island will change them both for the better. 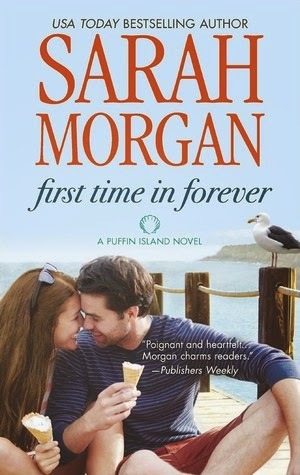 First Time in Forever by Sarah Morgan is a happy romance with a gorgeous beachside setting; this book is essential spring break reading. Emily is pretty down and out when she arrives on Puffin Island. She lost her boyfriend, her job, and her life in Manhattan, all to take care of Juliet. They are constantly on the watch for paparazzi and journalists to the point where Emily has Juliet go by her middle name Elizabeth or Lizzy. They are sort of living undercover, until Ryan, a local guy and Brittany's friend, sort of breaks them both out of their shells. At first he is just doing Brittany a favor by checking in on Emily, but the more he gets to know Emily, the more he is intrigued by her, even if she is a single mom, which is something that used to be an deal breaker for him. Emily definitely needs some help in First Time in Forever. Her childhood experiences have made her pretty much an ice-queen and she doesn't trust easily. To top it off, she doesn't want to raise Lizzy because she feels she isn't a fit mother. So she is constantly nervous around the child and unsure. She won't even let them go play on the beach due to her major fear of the water. The only person that can sort of get her out of this funk is actually Ryan. He helps her start living again and healing many of the emotional scars and baggage that she has been carrying around for years. But don't get me wrong, Ryan has some secrets as well. I thought there were some many cliche moments in First Time in Forever. You know the ones. The ones that always show up in romance novels, but that didn't stop me from enjoying the book. Also, I felt the story was very predictable; however, sometimes we need a book that's rainbows and butterflies, right? First Time in Forever is like a luxurious long day at the beach with nothing to do but relax, drink a tropical concoction and catch some rays. Plus, the setting of Puffin Island will have you longing for a weekend at your favorite beach town. If you are looking for something light, indulgent and happy to read while on spring break, look no further. Exactly. I needed a break from all the dark reads and this was perfect. It would have been even better if I was on vacation. :) Thanks for visiting, Christina! Christina, what a great story, though, right? Very interesting! I don't want to read books in the Summer, or during Spring Break, that force me to think too much - ha! I love a little predictable; it doesn't put me off at all, unless it's just horrible. Thanks for sharing this one! I started reading At the Water's Edge this weekend and I'm enjoying more than I'd expected; hope you have a great day! Exactly! That's my thinking too, Tara, so this one is perfect for that. I can't wait to read you review of At the Water's Edge. I'll keep my eye out. Thanks for visiting! I know you like romance, Jenny, so this book would definitely appeal to you. Plus, the beach setting is to die for, so I wanted to move to Puffin Island as well. :) I am sick of this winter weather. Thanks for visiting, Jenny!